Today we headed to the venue confident that we could scrape in a few points by the end of the competition. That night before, we had spent our time re-crimping and rewiring every motor cable as we were relatively certain that they, as well as the torque issues, were the main contributors to the dying motors. We also made a slight modification to the lid of our robot to make it easier to replace dead batteries and improve efficiency between runs. The slight modification in question was the cutting part of the lid off and liberally taping a flap that could be screwed down and would still be somewhat sand and gravel resistant. Kyle spent the night improving on the motion detection and other sensors (It will all be up on GitHub soon we promise!). Once again in the morning we strategically choose what runs we were doing so that we could maximise our points. We also had a few runs that we could not complete the other day such as the sand and gravel and align courses. We actually had some alright luck today as our robot got through quite a few runs completely (until the time ran out) which means we got many many more points than we did in the previous days. 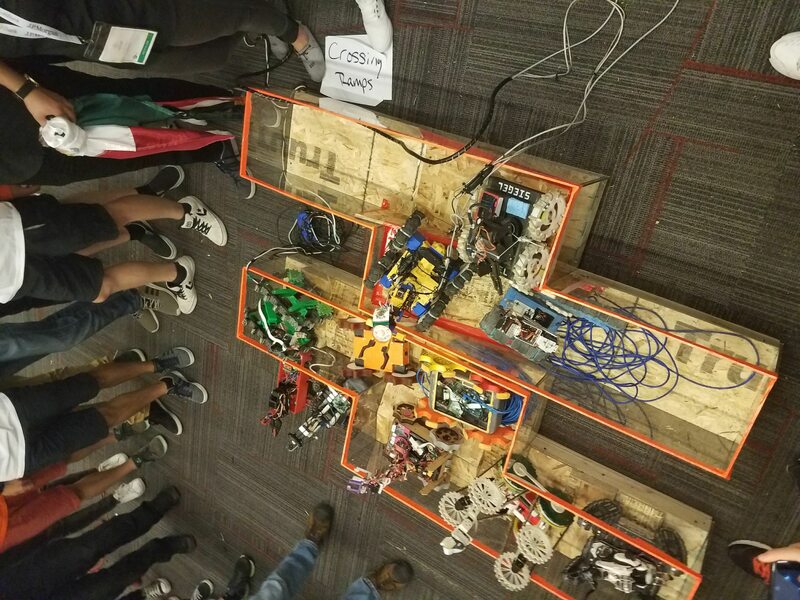 Image of the robot successfully completing a course! During the second half of the runs, we had a problem with the motor controller, more specifically the power cable that led to the controller. Because the cable was being quite dodgy it would mean that the robot would drop out and have to be restarted whenever the robot would go over any bumps that would move the cable. Because of the dropping out issue during the end of the day we couldn’t really get as many points as we had hoped for the driving section. Thankfully thanks to Kyle’s improvements, we got the highest amount of points for the final sensor test which greatly boosted our points. Once all the runs were completed we did a photo shoot of all the robots in the Rapidly-Manufactured Rescue League as well as the full-size ones. Once this was done Raymond announced the final scores and which teams were going to make it into the finals. Since we were sitting on dead last for the first few days we did very well considering all the setbacks that we had. We jumped from last to third last doing only three or four runs with a fully functioning robot. If we had the robot functioning form the start then we would have had a much higher chance of at least making it to the finals. 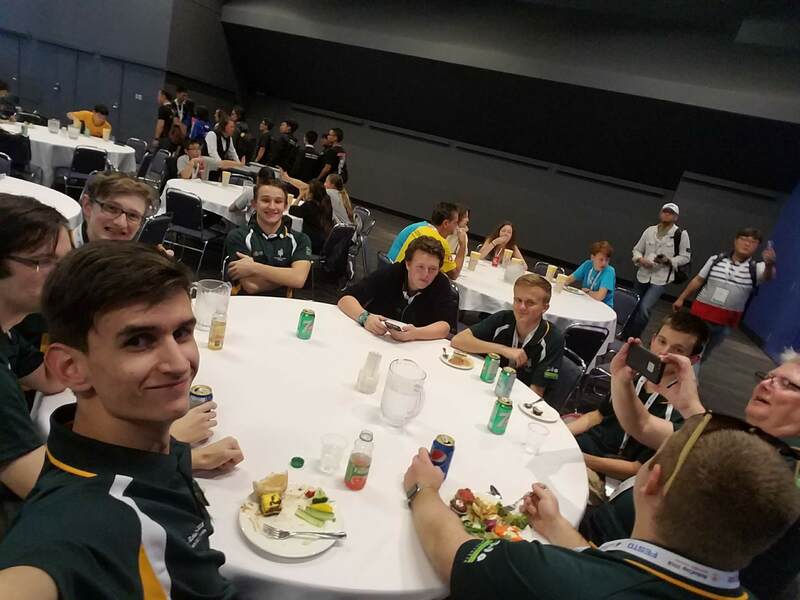 After the announcing of the finalists, we headed to the after competition get-together, where all the competitors in RoboCup got to recuperate a little bit with some loud music and some free food. That night we went back to the place we were staying, ultimately defeated but still determined to keep going with the S.A.R.T. Robot. 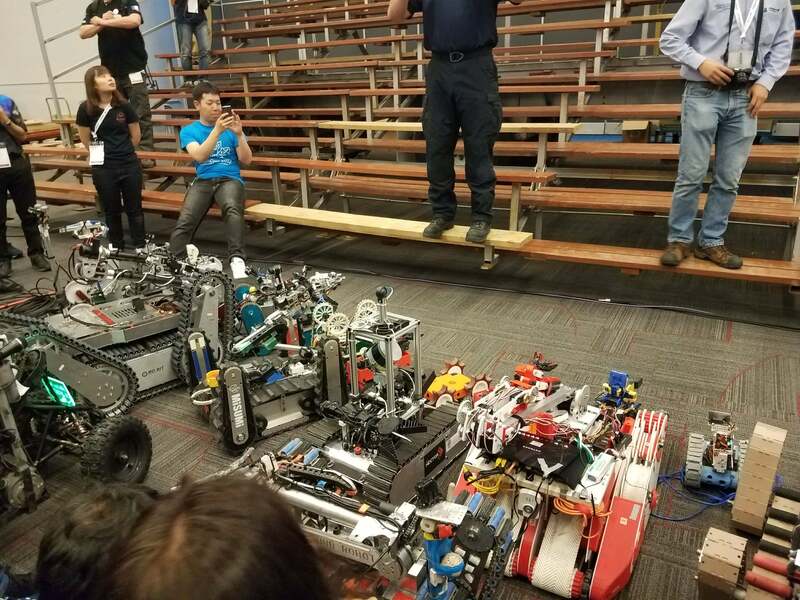 While Kyle and I were passed out from the tough day, Connor and Mr Stock were discussing new improvements that could be added to the robot knowing what it was like and how we performed in a competitive environment. With the new knowledge we have and the many things that we learnt during the competition, we will be improving our robot and making sure that hopefully next time it will run a bit more smoothly.